San Diego International Airport is the primary commercial airport for San Diego County. 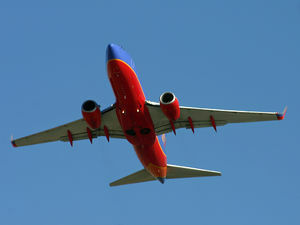 No airline maintains a hub there, and Southwest Airlines is the dominant carrier, followed closely by Alaska Airlines. The vast majority of scheduled flights are to points within North America; currently British Airways, Japan Airlines, and Lufthansa provide intercontinental service with flights to London-Heathrow, Tokyo-Narita, and Frankfurt, respectively. Edelweiss provides summer seasonal service to Zurich. Hawaiian Airlines and Alaska Airlines also provide transoceanic service with flights to Hawaii. The airport has only a single runway, 9/27, and normal operations call for arrivals and departures on runway 27. Runway 9 usage is uncommon. They will use runway 9 if the cloud ceilings are below 600 feet from airport elevation due to non-precision only approaches for runway 27. In addition, if the visibility is reduced to less than 1 1/2 miles, runway 9 will be used. Runway 9 has an operating ILS which can account for the lowered ceiling and visibility. Rarely will runway 9 be operated during clear days. The airport is notable for its approach to runway 27, which due to the airport's close proximity to Downtown San Diego, allows spotters a view of many aircraft flying level to the roofs of the downtown skyscrapers. 2.6 Ivy St. and Albatross St. The airport has a small free parking lot at the intersection of Harbor Dr. and Laurel St. for spotting. From here you will see aircraft arriving and departing on runway 27. You will need a ladder or tall vehicle to get camera lenses above the fence line for departure and taxi shots, though this may still be difficult as there is a second fence separating the shuttle bus access road from the ramp. However, you can photograph arrivals from street level with a long enough lens but you won't be able to get the "classic San Diego shot" with Mission Hills in the background nor the touchdown. Posted signs prohibit unattended vehicles. Avoid the adjacent Solar Turbines parking lot, but the sidewalk along Laurel St. should be okay. Lighting is best in the early afternoon, before 6:00, during summer. In the winter, light is typically good all day, though you may need to vary the angle of your shot as the sun moves across the sky. If you need a snack or drink, there is a convenience store at the Shell gas station located at the intersection of Laurel and Pacific Hwy (about a 5-10 minute walk). Exit the 5 and drive down Kettner Blvd, follow Kettner until you come to the Kettner and W Laurel St interesection, take a left on W Laurel and go up the big hill. Follow W Laurel until you get to 6th Ave. You can park on 6th Ave or continue straight and park on Balboa Dr. Walk along El Prado (Laurel turns into El Prado) until you get to the bridge. There is a sidewalk on the North and South side of the bridge. Take the South sidewalk. From the middle of the bridge you have an unobstructed view of the planes on final to runway 27 with the city in the background. NTC Park is located within the Liberty Station complex on the site of the former Naval Training Center. This facility is just west of the airport, and during normal operations with arrivals and departures on runway 27, departing aircraft fly overhead. Traditional side shots are tricky because most aircraft will be a bit high by the time they get to this area, but if you desire underside angles of departing aircraft, or just want to watch aircraft takeoff, this isn't a bad spot. It would likely be good during reverse operations with arrivals on runway 9, but as this typically happens during poor weather conditions, it still isn't amenable for photography. However, runway 9 may also be used when strong winds from the east, known as Santa Ana Winds, occur. You need a tall car or a tall ladder to reach this spot in order to go over the fence. It will give you spectacular shots of short finals with the San Diego Bay in the background. You can also get the touchdown. On the down side, this spot is not balanced (it is located on an incline plane part of the street) so getting level shots may be a challenge. This garage has amazing opportunities for capturing landings and taxiing to the runway. Takeoffs are a bit of a challenge as they require a long lense and the presence of heat haze is inevitable. The parking garage is located adjacent to Laurel Parking lot, on the other side of Laurel street. However, they do catch you fairly quickly and ask you to move. Unlike the Laurel, the staff here aren't nearly as aggressive in moving you off the property. If you do plan to park here, be warned. The last time I checked, they charge daily, not hourly. This isn't the best spot if you want to spot for a good amount of time. I have not been to this spot in nearly a year and a half, so maybe things have changed. As for now, just assume you will get asked to leave fairly quickly. Located on the top floor of this massive structure, this spot provides breathtaking views of the bay as well as a clear view of the touchdown of aircraft. This was the premier spot until a sign was listed on top of the roof stating "employees only." From then on, spotters usually tended to avoid this area. No further spotting was noted after the sign was put up. Ivy St. and Albatross St. Pretty self-explanatory where this spot is located, within the intersection of these two streets. This point allows incredible up-close landing shots which would only require a fairly small lens. Great for overhead shots and with a long enough lens, around 150mm or so, you may be able to film the touchdown as well. This pedestrian bridge over the 5 freeway offers excellent side shots framed by the downtown skyscrapers during final approach and fair views of landing/taxing. The bridge is accessible from both Kettner Blvd and India St, street parking is available nearby and the Middletown trolley station across Kettner also offers affordable parking. Most of the bridge's length is covered by a 6-7 foot high grated fence, so to achieve the classic San Diego shot from the median with eight lanes of freeway traffic stretching arrow straight towards the cylindrical Four Points hotel you'll need a lens small enough to poke through the grating or a stepladder. This lot is next to the official observation area at Laurel St. and Harbor Dr. It is tempting because it gets you closer to the action than the official area. However, it is private property and Solar Turbines security does patrol the lot and has asked spotters to leave. If you stay on the public sidewalk outside the lot along Laurel Dr., you should be okay. This is the multi-story parking structure that aircraft fly over just before landing on runway 27. While tempting because of the possibility of down-the-runway views of the airport and belly shots of landing aircraft, there are signs posted that taking photos and videos are prohibited, and that they can have you arrested for trespassing for doing anything other than being actively engaged in the parking of vehicles. Spotters visiting SAN may wish to consult the Flight Planner accessible at the San Diego International Airport website for exact and up-to-date information. Keep in mind also that many cargo flights do not operate a regular schedule on weekends or holidays. Airborne Express/DHL Cargo: The 767-200s belonging to Airborne Express parked on the northside of the field have been nicknamed "the sleeping giant" by SAN spotters because they hardly ever seem to move. Many of the 767-200s on this flight are painted in full DHL colors. 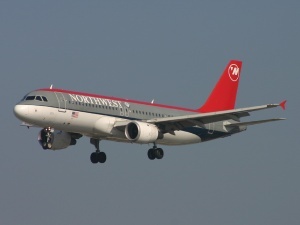 It typically arrives at approximately 7:00AM and departs to Phoenix, Arizona between 5:50PM and 7:00PM. Ameriflight: Ameriflight operates the Beech 1900 and Beech Airliner 99 to SAN in the early evening, with arrivals usually coming between 6:00PM and 7:00PM. FedEx Express: FedEx is the largest cargo carrier at SAN, with the longtime regular A300 and MD-10 flights largely replaced by the 757 and 767. Three flights usually arrive in the very early morning, before 6:00AM, and normally have all departed by 8:00AM. A second set of two flights typically arrives between 4:00PM and 6:30PM. These usually depart again between 7:00PM and 8:30PM. One of the Friday afternoon flights, typically arriving at approximately 5:00PM and departing after dark, and one of the Saturday morning flights, typically arriving at 5:30AM and departing between 7:00AM & 8:00PM, are usually operated by MD-10 equipment. MD-11's are still somewhat rare, but made some appearances during the 2015 Christmas season. The 757 only operates at night, so they are a bit hard to photograph. Fortunately, FedEx uses a 757 nearly every Tuesday in the summer that arrives in the afternoon, along with the majority of FedEx's fleet here. United Parcel Service (UPS): UPS operates two weekday flights on a somewhat variable schedule, generally using 767s. A morning flight usually arrives at approximately 5:00AM and departs around 6:30AM. A 767 arrives from the Hawaiian islands most weekday afternoons between 1:30PM and 3:30PM. Departures occur between 6:30AM and 7:30AM and in the evening between 7:30PM and 8:30PM. UPS does not operate on the weekends. There is a "cell phone" parking lot which offers up to one hour free parking for visitors waiting to pick up a passenger from an arriving flight, adjacent to the SAN Park Harbor Drive long term parking lot. Unlike the previous cell phone lot, it does offer views of the airport, however it is still not optimal for spotting as the paid long term parking lot is between this area and the taxiways. The cell phone lot has a couple of portable toilets and vending machines, along with monitors showing arriving flight information. However, if you're looking for video, this is the place to be (it will be even better if you bring a latter or stand on your car to fully see the touchdown as the spot is located abeam the threshold). San Diego Transit bus Route 992, sometimes known as the Flyer, and Route 923A provide service to the airport terminals. The lines originate in downtown San Diego, with several stops including one near the official observation lot at Laurel and Harbor. Connections to these routes can be made at various locations in downtown San Diego to other bus routes as well as the San Diego Trolley, Coaster, and Amtrak Pacific Surfliner trains.